Join us for an evening of cocktails, small bites, and party crafts—let our holiday party inspire yours! 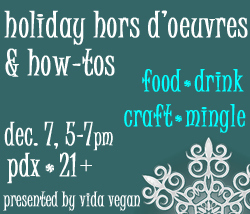 We’ll have vegan sweets and savories, party-worthy punch and cocktails/mocktails, and décor ideas to help get you ready for holiday entertainment. Demos, hands-on crafting, mingling, and a special take-home gift! This intimate event will be held at the Milagros Family Room, at 5433 NE 30th Ave, Portland, OR 97211. Saturday, December 7, 2013, 5-7pm • Tickets are nonrefundable. Limited tickets available via Eventbrite here!